As if one Bermuda triangle wasn’t enough to give us goosebumps, there is another scary place claimed to be one. It is the Lake of No Return that is also nicknamed as India’s Bermuda Triangle. The lake’s actual name is Nawngxyang but it is commonly known as the Lake of No Return. For over a century, people haven’t found the courage to visit the place even in the daytime. Because of a simple fact, they are scared of never returning back. Let’s find out more about this eerie place. The Lake of No Return is situated on the brink of Arunachal Pradesh, which falls into the Changlang district, and touches the Indian-Myanmar border. The water body is exactly located around the Pangsau Pass area in the southern region of Pansau or Pangsau Village. Pansau is a small village while the Pansau Pass is situated at a distance of 12km from Nampng village. Lake of No Return is approx. 1.4km long and 0.8km wide. It can be reached via the Ledo Road, which previously was called Stilwell Road. This area is inhabited by the Tangsa community. Since the relations between India and Myanmar have become friendlier than ever now, so, this lake has become a center of attraction to many. It is a lovely lake that offers maximum natural beauty and happens to be an inviting place for tourists. The well-known Pangsu Pass Winter Festival held in India every year is another attractive attraction for visiting the site. Despite its natural beauty and link with India, which is a tourist’s heaven, the lake is not among the most visited places yet. The reason is that its claim to fame still remains the many disappearances associated with it. Many of the strong hearted tourists who managed to visit it find it an adventurous place and a perfect site for those who love to live on the edge, the daredevil types. But, its reputation as Indian Bermuda triangle still prevents many from actually visiting it. The place is believed to be so haunted that the Pangsau Pass is widely known as the Hell Pass. So, what are those myths and legends that make it one of the scariest lakes to visit? Here are a few most popular ones. According to local villagers and people across India, whoever goes to this lake never comes back. But, the lake was never so famous for this particular feature before the World War II. It was only during the time of WWII that the lake’s malicious and mysterious nature was revealed to the world. According to military historians, during the World War II many allied forces aircrafts had to crash-land in this lake and none of them made it to the shore. It was quite a big surprise for the forces because if one aircraft had disappeared, it could have been the fault of the pilot. But, disappearance of an entire fleet was beyond their understanding. That’s why the lake is called a graveyard of aircrafts. The lake seems to have a liking for military personnel. There is another scary story related to this site where aircrafts are not involved but soldiers are. According to reports, after the WWII ended, a battalion of Japanese soldiers lost the track while returning to their base. Unfortunately they ended up getting trapped at the lake and never returned. There was no news about them and not even one soul could reach the destination to inform people about what happened. That’s not all! Many battalions that used to pass through that lake got lost without leaving a trace. What’s even more horrifying is that the troops that were sent to investigate these disappearances also were never heard of again. In another incident, a group of American military staff working on the Ledo road was sent to the lake for inspection and met the same fate as others who went there. So, we don’t exactly know what happened to them since they couldn’t come back to tell their tales of horror. 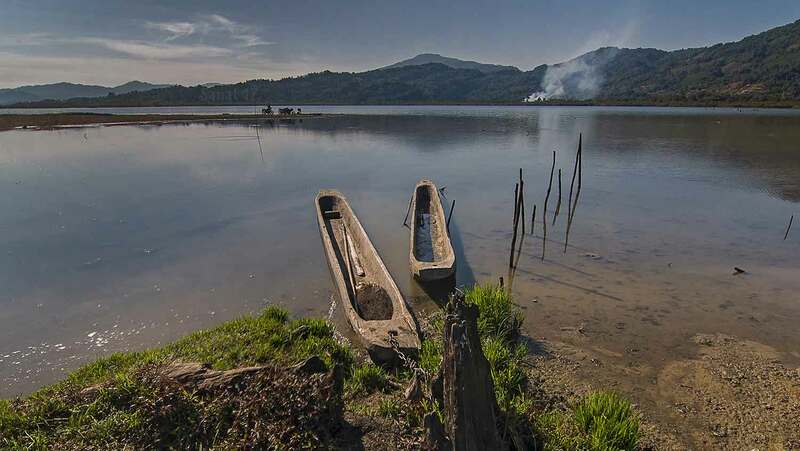 There is an ancient folktale that many villagers still believe to be the true cause behind the mysterious disappearances of those who visit the lake. The folklore has been passed on from a long time and from generation to generation, so there must be some truth to it. According to the folklore, it is the curse of an old woman and her granddaughter that has made the lake a haunted site. Legend has it that once upon a time, a villager caught a very big fish. It was so big that he invited the entire village to a feast from his side. But, he didn’t invite an old woman and her granddaughter. This made them feel sad and ignored….quite understandably. Their sadness angered the guardian of the lake and the two women were warned to leave the village immediately. The next morning, entire village turned into a lake. The lady had a big bamboo shaft, which she left behind while leaving. Villagers believe that the bamboo shaft still grows inside the lake and straps anyone who enters it. That’s why those who visit the lake never return. It is widely believed that due to being ignored at the great feast, the old lady and her granddaughter cursed the village so that nobody could live there. Perhaps their curse was so strong that even after many generations and centuries, nobody can stay alive there. The lake is believed to be responsible for the disappearance of not one or two but ten tribes of Israel. One of the tribesmen wrote a script in which the lake was mentioned as one of the sites the tribes were going to be passing through. Actually, these ten tribes were deported from the Israeli kingdom soon after the state was conquered by the Neo-Assyrian Empire. Many locals claim that they still feel that the souls of Israeli tribesmen are lurking near the lake. Modern theorists are obviously not convinced with the folklore. They state that such myths are just a publicity stunt to improve tourism in the Arunachal Pradesh area. Some people presented the theory that the Japanese soldiers contracted malaria and died due to that. But, there isn’t a clear explanation of what happened to those who went after them. How can all of them get struck by malaria? While some believe that the group that worked on the Ledo road went to the lake and got stuck to the underwater plants and couldn’t escape despite trying. Oh, but could these plants be the bamboo shafts that were left by the old lady? Who knows! Let’s accept the widely believed theory. The lake has a mysterious force just like the Bermuda Triangle that never lets anyone pass through it. What’s this force, how did it originate and what is the background story we may never know because whoever tried to solve this mystery didn’t return. If you consider them mere myths and legends then pick up your map visit the Lake of No Return to check if there is any truth in the stories.